It was called before the Dirty Dozen on the weekend that the cafe at the bottom of Sheoak made the best Vanilla Slices in Australia. I’ve heard those claims before, only to be disappointed with the result, a mouth full of sugary vanilla sludge. That looks like its all about to change. A super-massive amount of power delivered from a cyclist’s legs whilst riding a bicycle. A cause of significant damage to public roads and pelotons. This week I had a chat with Troy from Watt Bomb Apparel in Melbourne, to find out who Watt Bomb is and what makes them tick. Watt Bomb Apparel is a premium apparel brand producing custom apparel with no minimum orders. Whether you order 1 piece or 10,000 pieces, the choice is yours. We specialise in cycling apparel and have access to world leading fabrics, chamois and garment construction techniques. We’re based in Geelong, on the surf coast. Geelong has some of the most scenic rides you can images. We’re spoilt for choice with beachside, great ocean road or the Otways right on our door step. We started in 2015 when we realised that there was a real need for premium apparel that didn’t break the bank. We had been getting custom apparel made by some well known brands and felt it missed the mark. There were too many hurdles… “you must have a minimum of 10 base pieces, you can’t do certain colours, the lead time is 8 weeks” and the list goes on… This is where we thought we can do this better! Who are the people behind Watt Bomb Apparel and what are their roles? I’m the founder and owner of Watt Bomb Apparel. We have a number of contract staff who work for us depending on the work load and time of year. We have designers, account managers and book keepers working to keep the business running. I started cycling at around 16 years of age, so quite late really. I competed in triathlons (don’t hold that against me) for approximately 10 years. In 2005 I injured my knee meaning that I could only cycle and running was off the cards for a while. So I threw myself into cycling and never looked back. Crit racing is something that just grabs me, nothing compares to bumping shoulders around a corner at 45-50km/h. It’s just a huge adrenaline rush. For us being a small business it’s about the relationships we form with our customers. When you spend time with people creating their vision through their custom apparel, you build a strong bond with them and really get to know them… this is something that you can’t get through an “off the shelf” kit. The other way we’re unique is through our ability to offer no minimum order and a turn around time of as little as 14 days! What is you Vision for Watt Bomb Apparel? We want to see as many people bringing their own style to the bunches. Why wear someone else’s style or design when you can create your own? How do you stay in touch with what your clients want / need? Being avid cyclists we have our ears to the ground. We’re in bunches all over the place throughout the year. This helps keep us intact. On the flip side we’re constantly looking at research and development and trying to find new raw materials that we believe our customers will love. How do you keep up to speed with changes in the industry? Research and development is a big part of our business. We have connections to fabric’s manufactures all around the world who are constantly pushing the envelope on the fabric technology front. What has changed for Watt Bomb Apparel since the start? A lot has changed for us since the start. We originally had a focus on producing our own designs, we still do this but it’s not the main focus of our business. Now custom is the main focus. We’ve worked hard with our manufactures to constantly deliver the best products, at great prices with fast turn around times. Do you provide any support to the cycling industry such as team sponsorship etc? We sure do! Watt Bomb Apparel have a race team called “Watt Bomb Racing”. Our guys are hitting up the Victorian Road Series (VRS) calendar and local races all year round. We’re not a very big team in terms of budget but the guys have a crack and rip up some races which is really exciting to see. For us this is about helping riders to develop and assisting them to hopefully take the next step to the National Road Series (NRS) and beyond. Outside of our team we also work closely with local cycling clubs providing support and sponsorship for the events. What major challenges for your business? The biggest challenge for all cycling apparel manufactures is keeping up with the constant changes to the raw materials used to construct high tech garments. R & D is once of the most important aspects of our business. Regular jobs for us are producing kits for cycling clubs. This is an area that has come a long way form the time where no-one wad to be seen in their club kits because they were “unfashionable”. The clubs have realised this and are now on trend and producing really great designs that still represent their brand. Last year we were approached to produce the leaders jersey for the Jayco Hearld Sun Tour for 2017. Seeing riders like Chris Froome in a jersey we have designs and manufactured was pretty cool. It’s something that 3 years ago we could never have imagined. Thanks Troy for opening the door into Watt Bomb Apparel. Further information can be found here. Oh, and Watt Bomb manufactured the Rads Cycling cap, designed by the RADS team in Adelaide, that hit the markets earlier this year, one that I was fortunate to purchase just before my trip to France. I saw a few of them out over the weekend on the ADD17 as well. OK, last weekend was the annual Adelaide Dirty Dozen, by my reckoning the 6th instalment of this fascinatingly masochistic cycling event tackling in excess of 12 of the hardest hills in the Mt Lofty Ranges just to the East of Adelaide. Some say he is an escapee from Nauru and should be deported, but we all know him as Adam “Spoils Everything” Willis, or the Jerk, or “that f$#2ard”, or one of many other apt names mentioned befiore, during and most probably after the ride. 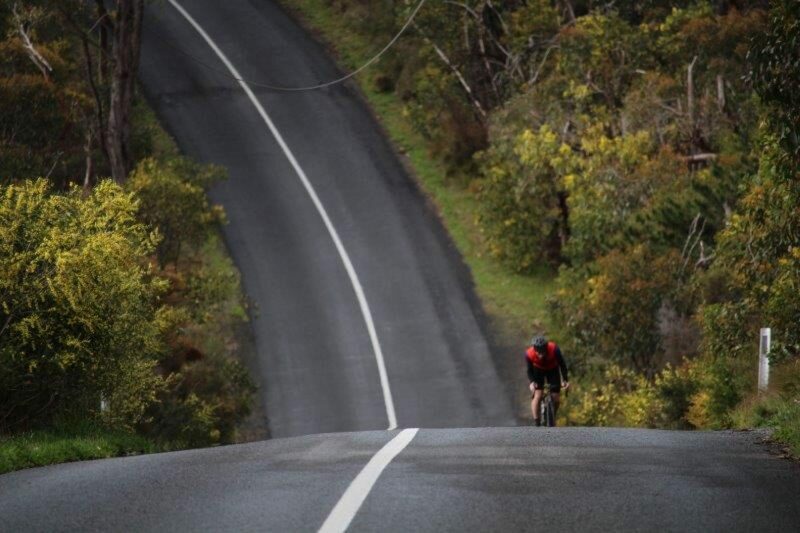 He has produced the toughest annual cycling challenges in Adelaide. They get tougher each year because in his mind, too many finished last year. There are also queries about his schooling. Last time I looked, a dozen was 12, and even taking into account he probably was a baker in a past life, he was still 2 out this year. Taking 3 of Adelaide steepest consecutive climbs and calling them one climb just doesn’t cut it. There were 15 hills this year, and that’s not taking into account the small rolling hills as you transition from one to the next. All up, just shy of 4,000 m climbing this year over approx 140km. And yet we still turn up in droves, for what reasons I’m not sure, probably to prove Adam Wrong, either that, or just an excuse personally abuse Adam in the streets and spit in his face. Me, I wouldn’t do nasty things like that. I’m much happier doing it from the safety of a keyboard. This year there was 200 ADD wanabees. At the time of writing, some 3 days after the start of the ADD2017, there were a few still finishing so the finishing numbers haven’t been finalised, but with the better weather conditions, I suspect there were a fair few finishers, so ADD2018 is gonna be a doozy. Below are some of my pictures from the start, and a few I’ve grabbed off social media. And these are those Vanilla slices. The following photos have been grabbed from Andrew Watsons Photography Facebook site. With all the above being said and done, it was a spectacularly successful day, and Kudos to Adam in particular, the support teams as noted below, and all the riders who turned up. Torsten Bunge and Costa Exchange in the SA Produce Market for the 60kg of bananas. , the family who set up drinks at the top of coach road, and then moved over to the top of Sheoak after Cherryville was removed from the course at late notice due to local complaints, and moved over to Corkscrew. Keep fighting those battles for us Adam, we’ve got you’re back. Oh, and yes, I did finish. But not without a few dramas. On the start of the 3rd climb – Kensi Road, I pulled my rear derailer into my rear wheel. I wa able to pull it back out, but needed to ride carefully back home and swap over to my Jamis Commuting bike and rejoin where I left some 50 minutes earlier. A completely different setup, shoes, pedals, gearing (4 less teeth on the cassette) had me grinding up climbs where I would normally spin. OUCH. The kind of person who bangs on about how great it is to ride a bike. The sound of rubber on asphalt, the smell of the countryside, how being on two wheels gives them a new zest for life. The Masochists are the type of cyclists who tell you they’ve spent their weekend doing hill repeats of Coach Road. Their exploits seem ridiculous, even to other cyclists, but to them it’s all about the challenge. The Accumulators take any opportunity to rack up the kilometres, even if it means making their life significantly harder. The kind of person who wheels out their Dogma for a trip to the local servo when they need a the morning newspaper, and Strava it. Hoarders have a different kit for every month of the year, and you rarely see them wearing the same jersey twice. They’ve got a whole drawer in their house dedicated to their collection of knee warmers. They continuously surf the web looking for and purchasing the ultimate bargain, even if it means N+3 of just about anything that can be bought. These people spend hours of their lives plotting potential routes on Strava and then never actually ride them because “the weather looks a bit iffy”. Be it meteorological problems or an unidentified niggling injury, these riders will find any excuse not to get out on their bikes. This is the kind of person who can spot a compact FSA chainset from 30 metres off and notices immediately if you get a new headset cap. We all love some shiny new things for our bike, but the Tech Geeks know everything there is to know about the latest trends. These riders are often too poor to buy a drink at the coffee stop because they’re saving for their new gadgets. While they know all there is to know about the technology itself, they are often completely useless at fitting it on their bike or fixing it if it goes wrong. This is the kind of person who can spot a compact FSA chainset from 30 metres off and then berates you for the other 29 metres for your decision to purchase such an apparently terrible item with such obscene gear ratios. “If we’re to climb that mountain in an hour we’ll have to average 300W,” they tell you, putting their calculator and power charts down. This despite the fact they’ve never put out 300W in their life, let alone on a 10 per cent gradient for 60 minutes. Anyone who uses Strava can get a little engrossed in their stats after a ride, but the Statistician will be able to recall their exact progression up that hill near their house at will, and often without prompt. Usually seen slopping muesli on their keyboards and uploading the same six-mile route on Strava two times a day. They can instantly recall the result of any race in history, as well as the components used on most of the bikes used. Like The Hedonists they’re likely to ride a really old bike, maybe a replica of Giovanni Battaglin’s 1979 Colnago with ridiculous gear ratios. As such they often avoid routes with major hills as they physically won’t be able to get up them. But if it was good enough for Eddy Merckx, it’s good enough for them. I received my first bike at the age of 5 and have been riding ever since. I’ve tried other sporting activities but enjoy cycling the most. There isn’t anything that compares to staying fit, camaraderie and seeing the world. I haven’t owned many bikes in my lifetime, only 4. Apart from the Ricardo racer, my love for the sport really began with a custom made Pursuit steel frame made by Super Elliots, I still have that bike now its relegated to a commuter. How many bikes do you currently own and what is your main go to bike? The freedom cycling give me is like nothing else, when I ride on my own its very meditative, I’m able to think of think of things other than work and life in general, It gives me an opportunity to recharge my soul, that’s very important to me. Its a very important aspect to my well being so for me it isn’t just pedalling a bike its so much more. You own and operate Red Berry, a cafe that provides strong support to local cyclists, and thanks btw. Do you have any standout cycling moments at Red Berry? I’m very fortunate to be able to combine my passion for coffee and bikes at the same time. It was always my intention to be able to provide exceptional coffee origins with “click” “clack” of cycling shoes. So in answer to your question there really isn’t a stand out moment but rather every day offers both me and my customers an individual experience. Overall though and this applies to all my customers the greatest enjoyment has to be the conversation I have, they’re simply fantastic to have. Do you do all your own maintenance? I carry out all maintenance except bottom bracket, It’s not hard and I enjoy looking after my bikes. I don’t have anything specific, for me its the total package, the bike the kit etc. Unfortunately yes I have, twice with cars involved, the recovery and reahabilitation is the hardest thing to deal with especially when I require my arms and hands to make that perfect espresso. I don’t let it get me down though, I just dust myself off and get back on my bike as soon as practically possible. Lying to my partner… perhaps like the many stories I have heard at Red Berry Espresso, isn’t that secret men’s business. I can’t add anything more without incriminating myself. Definitely have to travel to Europe and climb some epic peaks that would be fantastic, and of course combine it with great food and coffee. Spain here I come! I tend not to follow the pack so I don’t have anything specific really I prefer to go with the flow frequently changing as I go, so I may like something this month and move to something new the next, variety is what I like the most. Having said that, I special mention should go out to Steve at Road, Track and Triathalon I’ve purchased my last 2 bikes from him, he’s a no-nonsense guy and I love the Italian bikes he sells. I thinks like most Adelaide I love the accessibility Adelaide has to offer, we have also for a few year now been experiencing and explosion of great eateries and cafe’s. Anywhere serving good food, Pizza and beer. Your ongoing support for Adelaide cyclists as well as the troops coming in for the Summer Tour is much appreciated. If you haven’t been in Red Berry before, its only a short hop frm the city on the way up towards the hills. Oh, and there is another Sky Training session over in Spain, being led by some dude called Froome. He’s been training on hills like this – the Sierra de la Pandera. Next postTitanium – What can I say!